Some of the best performance accessories have rolled out of the NDZ factory, and this is no exception. 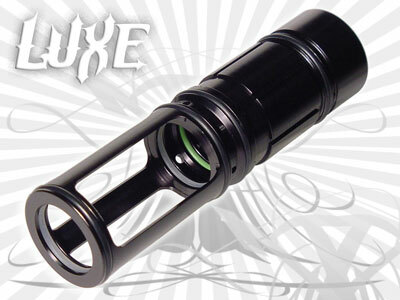 Based on the design of the popular ULP, LP Shocker firing cans, we bring you the LUXE Low Pressure firing can. Air volume capacity has been increased, and o-ring friction has been reduced. These come in a black anodize finish. Our 2 piece firing can design offers easy internal o-ring replacement, BIG hit with all players !!! Note: Since all makers are different, tuning adjustments should be made to achieve the best possible operation/ efficiency. Simply put, the Stinger series of bolts rock. The smoothest operating bolt that you will find.. Our refined high performance bolt enhances airflow while reducing o-ring friction. improved hard coat process and super slick Teflon treatment process to reduce wear, you can feel it !!! 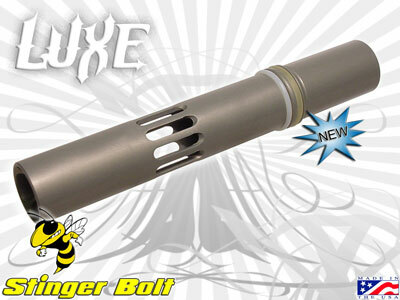 Simply put, the Stinger series of bolts rock. The smoothest operating bolt that you will find.. Our refined high performance bolt enhances airflow while reducing o-ring friction. These bolts have been modded to except the internal spring.